A few years ago, Jarod McGuffey sat in the staff lounge at his school in Fraser discussing Michigan’s broken school funding system, over-testing, declining enrollment at teacher prep programs in state universities, and other growing concerns. Then he took it to the next step. The 21st-Century literacy teacher at Disney Elementary School decided to get involved in finding solutions by becoming a fellow in a teacher leadership program—Oakland University’s Galileo Teacher Leadership Consortium. Now he’s clearing a path for other educators to follow. 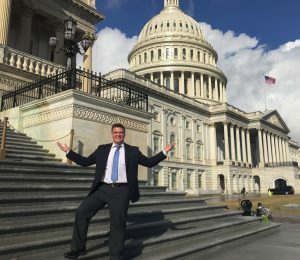 McGuffey co-founded a grassroots effort that aims to connect teacher advocates with legislators and other policymakers in dialogue and partnerships. He’s hoping to recruit two teachers from every school in Michigan to join Galileo’s “Trusted Voices” campaign. Many school employees feel helpless and voiceless against a tide of bad public policy, so this initiative is about empowering educators to claim a seat at the table, he said. Training and resources are provided. Educators who join the effort are connected to their local elected representatives and senators as expert voices on education policy matters. Lawmakers are encouraged to consult with Trusted Voices leaders on education bills under consideration. In his advocacy work through the campaign, McGuffey is focusing on garnering attention and action on a recent study by a coalition of state business and education leaders that showed Michigan is underfunding public education by nearly $2,000 per student. “This is the perfect time to get out there and make some changes,” he said. Visit TrustedVoicesED.com to learn more and sign up.